Well done to all the young people nominated by their schools for the Good Citizens’ Award 2013. 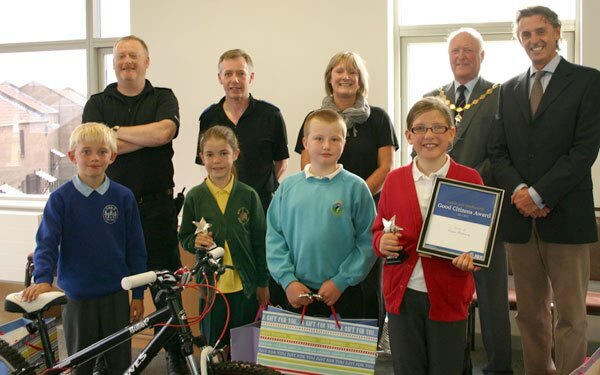 And congratulations to the overall winner, Bobby Stone from Amble Links First School. Warkworth First School nominated Hope Vernon of year three, St. Cuthbert’s First School nominated Megan McGarvey of year three, Amble First School nominated Rielly Stewart of year four. Schools look for commitment by pupils, to whatever activity they participate in, caring about others, making time to do regular voluntary work, – sometimes while overcoming physical difficulties. Headteacher Paul Heeley accepted the schools award – for the third year the winning youngster has attended Amble Links school. Now in its fourth year, the Amble and Warkworth Good Citizens’ Award is the brainchild of CSO Darin Fawcett. The aim is to celebrate outstanding behaviour and conduct in our youngsters and encourage our future good citizens. CSO Darin Fawcett said “I’d like to thank everyone who donated prizes and supported this award. And I’d particularly like to thank Nick and Katie Spurr for once again donating the first prize”.